Begin by washing out the cans to remove any sticky residue and let dry. Using an x-acto knife on the edge of can make a slice big enough for a scissor blade and then cut the tops and bottoms off with scissors. 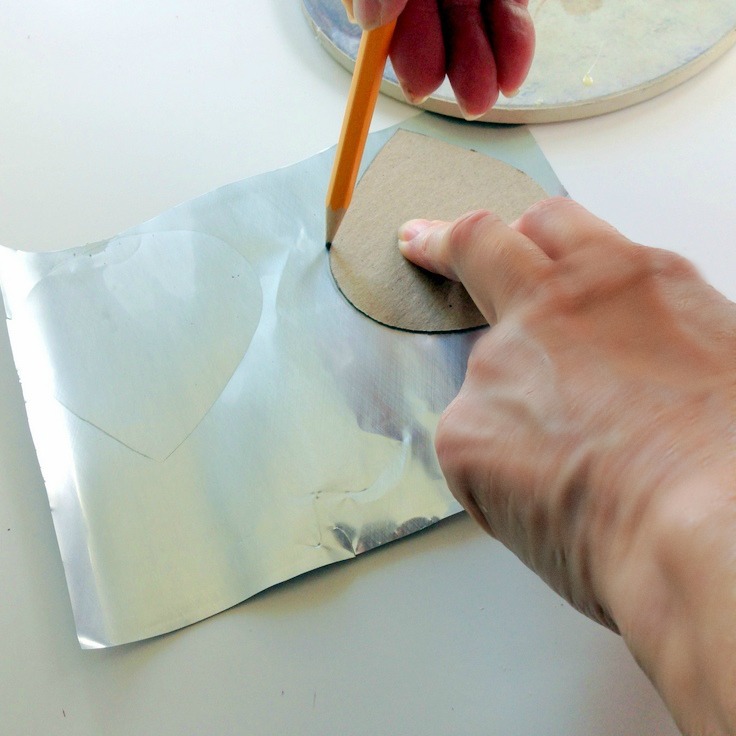 Next, cut through the length of the can to open and cut off any metal slivers or jagged edges. *CAUTION: Be very careful with the sharp edges of cut cans. Roll the cut aluminum piece in the opposite direction - and smoothing out over something like a counter edge to help remove the curl of the can. Freehand cut out a petal pattern from paper and trace on cardboard for a sturdy template. Lay the cardboard pattern on the aluminum and trace outline or just freehand cut out petals without tracing like I ended up doing. It's much quicker to do since you need a lot of petals. For the candle holder base, cutout a 4inch circle from the aluminum can and glue onto a cork sheet. Cut out the cork and attached aluminum. Repeat steps for cutting cans and petals You will need at least 32 petals. Spray paint the petals and let dry. To add dimension to the petals, roll the edges using the stem of a paint brush or pencil . . .
and glue onto the edge of the circle, creating the first layer, all the way around using super glue gel. Begin gluing on the second layer, overlapping and between the first row around. Continue adding layers, alternating between petals until satisfied with the fullness. It should look like a lovely rose petal shape. Add the last layer of petals to enhance the candle, leaving an opening to accommodate a candle or jar. Place a LED votive candle in the center, turn a colorful jar upside down and have fun outdoors with this cool effect! What a lovely way to repurpose those unwanted cans! That's cool, Gail! What a great way to recycle those cans! WOW this is fabulous Gail.....you really have worked hard but the end result is totally worth the effort!! loving this upcycled soda or beer can candle holder! and what a great idea to use the colored jar too! what a fun way to light up the night Gail! :) Thanks for sharing the tute! Very sweet project. Not only cute, but recycling as well. Such a fun and creative idea for candles. This is so pretty, Gail! What a creative mind you have! The finished candle holder is gorgeous! Looking at the finished candle holder one would never believe that it came from soda or beer cans. A beautiful project to brighten up a whole room. I just love a good recycle project. Gorgeous as usual Gail. I had to pin. This is absolutely ingenious. I will never look at a soda can in the same way, what a beautiful candle holder. This turned out beautifully! I love working with metal and have found that craft punches work well with cutting most thin metals - might help :) Well done! Pinning to share. Thanks for sharing with us at Snickerdoodle Sunday! You always come up with the best DIY ideas, Gail!! This is so cool!! I've shared it my FB page too! How big would the petals be? Also on one site you say to make a 6" circle and here you say a 4" circle, so which once should I use? So pretty! I had no idea that cans could be cut with scissors. The candle holder would look so great made in multiples and used as centerpieces at a wedding or party. Does the super glue gel "take hold" fairly quickly? I was wondering about how long you have to hold each petal in place. Thanks for sharing this great idea with us.